Linda (VanCoulter) White found peace on Saturday, Jan. 12, 2019, due to natural causes. She is survived by her devoted husband of 65 years, Gerald, four daughters (who are best friends – a testament to family) Pat Johnson (Dennis) and their children Bryan and Justin, Jean Hanson (Neil) and their son Brad, Peggy Radel (Ron)and their children Jeremiah and Alexandra and Vera White (Dell Bryant) and her children Cameron and Danielle as well as nine great grandchildren. Linda engaged in life to the fullest. After her marriage to Gerald she joined him in the family business: The Mill Creek Cheese Factory. In the 1960s, Linda and Gerald opened White Snowmobile and Marine “where the service is as good as the price.” Linda was an award-winning drag and oval track snowmobile racer. She and Gerald were avid travelers who motor homed throughout North America with their children and as empty nesters. Linda insisted upon stopping at every historical marker. Every single one. Her daughters and husband called them “hysterical” markers because ‘oh no, not another one!’ Because of that, she instilled a love of travel among her daughters. Smart lady. She loved to play with her dog and cats, take naps, plant flowers and spend summer weekends on their “White House” houseboat docked on the Mississippi. 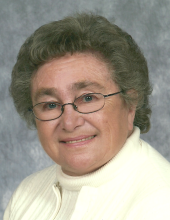 Throughout her active life, Linda volunteered her talents and held several jobs including catechism teacher and 4-H Leader, in-home daycare provider, school bus driver, waitress, and Roto-Zip employee. She loved reading everything including encyclopedias, but her favorite choice was Stephen King novels. While traveling in Maine she sought out his home and when she courageously knocked on his door Mr. King answered. Arriving home, she found a personal letter in the mailbox from Mr. King. She was a lady who made an impression. Linda was a fiercely independent woman who mastered the art of getting her way and was a frugal money manager – so much so that she ironed used Christmas paper to wrap next year’s presents. She didn’t have anyone fooled. Linda was a devout Catholic and member of St. John the Baptist (Mill Creek) Church in Arena where a Mass of Christian Burial will be held on Friday, January 18th at 10:30. Online condolences available at www.staffordfuneralhomes.com. The Richardson-Stafford Funeral Home is assisting the family with the arrangements. "Email Address" would like to share the life celebration of Linda M. White. Click on the "link" to go to share a favorite memory or leave a condolence message for the family.